Inventory gurus...I have a question. I just did our rollup/revalue for our manufactured items and all went well. I remember something about that there isn't a good way to roll our purchased items costs to update the standard on those, correct? I know that there are tools such as with Willoware that make that easy (haven't purchased yet...), but is there a good way within GP to do this? Just looking to get all costs up to date. The cost we control withing GP using the rollup/revalue are the Pending Material Cost, Pending Fixed Overhead, and Routing. Changes to these fields will update the Standard Cost. There are two places you can do this in GP. You can use the Standard Cost Changes screen or the Standard Item Material Costs screen. 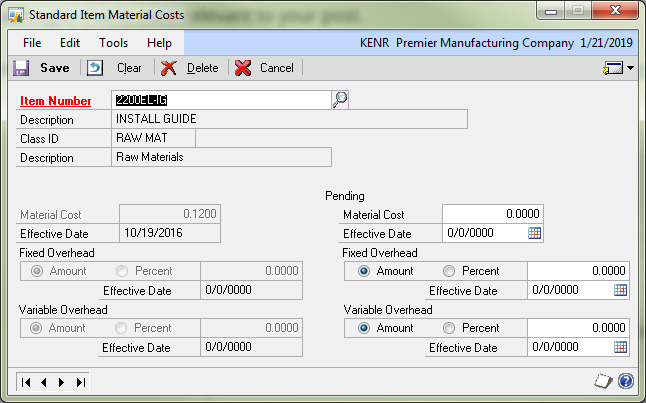 We use the later to change the Pending Material Cost and Landed Cost (Fixed Overhead). These will roll through the parent parts on the BOM and you can look at the report before posting the changes. You can change the Routing by editing the Work Center, Operation Code, and Sequence changes for the Item and Routing. I might be missing something but that's what I remember.